Alloys International are Australia’s foremost experts on hardfacing. 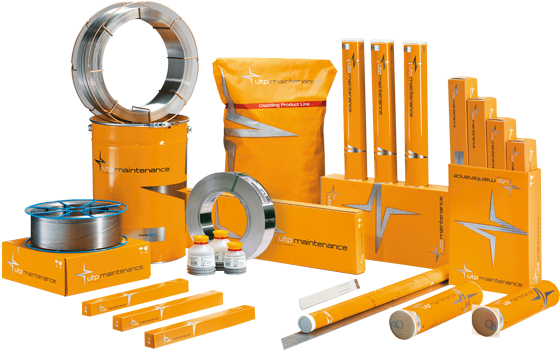 We have been supplying hardfacing consumables for almost 40 years. With high local stock, we are able to provide the right advice for protection against abrasion, corrosion, high temperature, impact or any combination thereof. 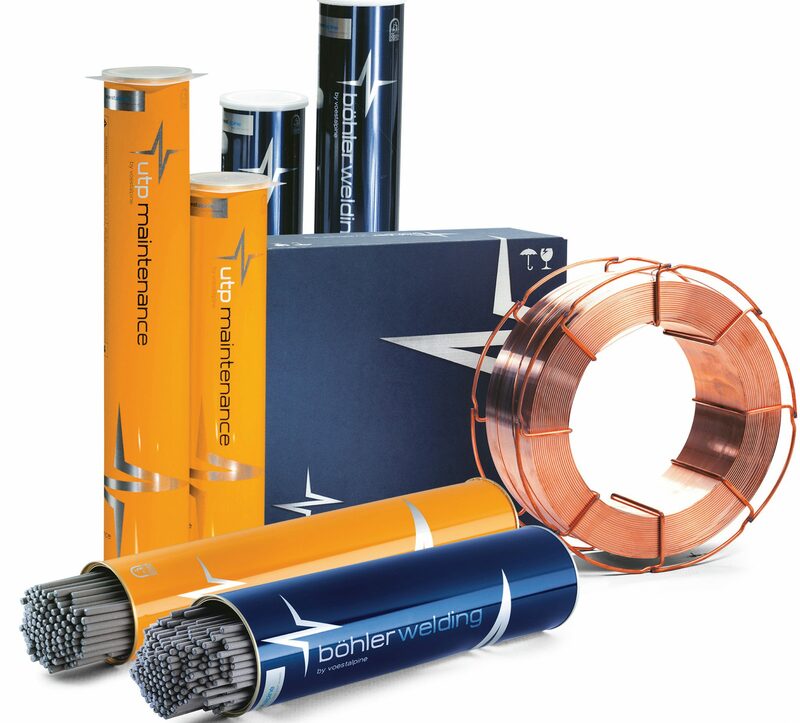 Products available include Stick Electrodes (SMA), TIG rods (GTAW), Cored wires, MIG/MAG solid wires, Submerged arc wires and flux (SAW), electroslag strip cladding strip and flux (ESW), and powders for Laser or PTA welding. W.T.I.A Tech Note 4 : 1215-A4 Basic coated electrode for surfacing parts subject to heavy impacts. Joining of 14% Mn steels. Underlay prior to hard surfacing. Applications include: railway equipment (Mn steel), large crusher parts, crusher hammers, toothed shells of coke cutters, shovel and dredging buckets. DIN E3 - 45+-umhult Rutile coated electrode for retouching edges and rebuilding steel parts for hot and cold service. Applications include: Shear blades, forging dies, runways, cams, and slides. Cladding of mild or low alloy steels for the same. Applications involving metal to metal wear up to 550°C with thermal and mechanical shock properties. AI-0511-TDS Rutile coated electrode for surfacing parts subject to abrasion with high compression stress or shocks. Also used to resist metal-to-metal wear in wet or dry conditions. Applications include: Crusher hammers, mixers, dredging parts, gears, cams etc. DIN 8555 : E3-SST umhult Rutile coated electrode for surfacing tools for high temp service. Applications include: Dies, hot shear blades, pit points and stamping punches. Produces a tool steel type deposit capable of resisting metal-to-metal wear up to 500°C. W.T.I.A Tech Note 4 : 1860-A4 Basic coated electrode for surfacing parts subject to severe abrasion with medium impact likely to be absorbed elastically. Electrode features excellent weldability; for example, surfacing of conveyor screws, mixer blades, sand pumps, coal pulverisers, scrapers. DIN 8555: E3-60T Rutile coated electrode for surfacing parts subject to metal-to-metal wear up to 550°C without thermal shocks. Applications include: cold shear blades, wire guides, twist guides, machine tools and milling cutters. This alloy produces a high-speed steel type deposit. W.T.I.A. Tech Note 4 : 2355-A1 Synthetic basic coated electrode with high recovery (160%) for hardfacing. Resisting mineral wear by friction, combined with shocks and compression – austenitic matrix containing Cr carbides. Pleasant fusion – self releasing slag – deposit resists to corrosion (32% Cr) and to hear up to 200oC. Eventual surfacing in 1, 2 or 3 layers – for all pieces subject to high abrasion combined with a good resistance to shocks. Only machinable by grinding. Applications include: excavating and crashing equipment, surfacing of endless screws, mixer blades, pump bodies for abrasive materials, concrete pumps, ore crushing, press screws for bricks. W.T.I.A. Tech Note 4 : 2360-A4 Hardfacing electrode with high efficiency basic coating (190%). Highly resistance to abrasion due to its high content of Cr and C: the service life of surfaced piece can be 50 times longer as for conventional electrodes of similar hardness. Austenitic matrix with Cr carbides – resistance to moderate shock – deposit 1 or 2 layers max – agreeable fusion – no slag – bead very smooth. For all pieces subject to low or moderate shock where an important resistance to abrasion is required. The formation of cracks on the metal deposit is normal for this type of deposit. Applications include: Crusher parts, conveyor screws, excavator teeth, crushing of mineral materials, concrete pumps, ploughshare, pump bodies for abrasive materials. W.T.I.A. Tech Note 4 : 2355-A1 AI-0538T is a tubular electrode depositing an Austenitic Chromium White Iron. Direct application to Austenitic Manganese Steels and Carbon Steels is possible. AI-0538T has a moisture resistant coating. There is no alloy contribution from the flux. Relief checks are normal in deposits. Multi layers up to three runs acceptable. Features fume control and ease of running. 6.0 mm may be easily used in out of position deposits. No preheat required on mild steel or grey iron. W.T.I.A. Tech Note 4 : 2450-A4 Basic coated, high recovery electrode for surfacing parts subject to severe abrasion combined with high impacts. Applications include: Gyratory crusher hammers, coke cutters, wear plates on hoppers, vibrating screens, scrap collector plates, star crushers and rolls crushers. This alloy can be welded onto 14% Manganese steel without underlay. W.T.I.A. Tech Note 4 : 2460-A4 High recovery, basic coated electrode for surfacing parts subject to severe abrasion with medium impacts at temperatures not higher than 450°C. Applications include: Screws of refractory material presses, screws of brick presses, and screws of cement presses. This alloy also has the characteristic of achieving full hardness in the first layer. W.T.I.A. Tech Note 4 : 2460-A1 AI-0543T is a tubular electrode designed to give very good impact resistance yet retain a high hardness. There is less relief checking than Austenitic White Irons. 6.0 mm may be deposited out of position. Moisture resistant coating. No alloy contribution from the flux. Multi layers up to three runs acceptable. No preheat required on mild steel or grey iron. AI-0543T deposits complex carbide alloy. Applications include: Rail ballast tampers, crusher hammers, dredge teeth, dozer end plates, ripper teeth, grizzly bars and steel work mill guide. W.T.I.A. Tech Note 4 : 2460-A4 Basic coated electrode for surfacing parts subject to extremely severe abrasion with medium impacts at temperatures up to 600-650°C. Applications include: Sinter crushers, scraper wires in zinc industries, scrap collectors, mechanical strokers and blast furnace chutes. W.T.I.A. Tech Note 4 : 2360-A1 AI-0553T is a tubular electrode containing tungsten carbides in a matrix of chromium carbide designed to give excellent abrasion resistance and moderate impact resistance at high hardness. The 6mm electrode can be used out of position. Deposits will relief check. Up to two passes may be applied. AI-0553T has a moisture resistant flux coating. There is no alloy contribution from the flux. No preheat is required for direct application to grey cast iron or low alloy steel. Applications include: Rail ballast tampers, Dredge Teeth, Grizzly Bars, Mixer paddles, Steel mill guides, brickworks components etc. W.T.I.A. Tech Note 4 : 2355-A1 AI-0554T is a tubular electrode, which has lower carbon and chromium than AI 558T to give improved impact performance. •	Features ease of deposition, controlled fume. •	Minimum or no splatter. Deposits will relief check. •	Multi layers may be applied Moisture resistant flux coating. •	No preheat required for direct application to grey cast iron or low alloy steel. Applications include: Brickworks Swing and Fixed Hammers, Ripper Teeth, Dozer End Plates, Dredge Teeth, Grizzly Bars, etc. W.T.I.A. Tech Note 4 : 1860-A4 AI-0560 is a basic coated electrode for hardfacing. AI-0560 is a martensitic carbide providing good abrasion and medium impact resistance. It is excellent for resistance against compressive stresses and impact. Applications include: Parts of steel, cast steel, high Mn steel, subject to simultaneous impact, abrasion and compression. Typical application fields include earth moving equipment, drilling equipment, crusher jaws, excavator teeth, cones, hammermill hammers and cold cutting tools. AI-0579-Canegrip-TDS A coated stick electrode designed primarily for the on-site surfacing of cast-iron sugar mill rolls to enhance the roughness and prevent excessive wear taking place on the gripping surfaces of the rolls. AI-0579 can also be used generally for surfacing parts subject to severe abrasion with medium impact. The alloy consists of chromium carbides in an austenitic matrix resulting in a deposit, which has an excellent combination of impact and abrasion resistance. AI-1746-TDS AI-1746 is a premium Martensitic Surfacing Alloy specifically designed for hardfacing out of position in the horizontal or vertical-up modes under gas shielding. AI-1746 is ideal for hardfacing components subjected to friction and low stress abrasive wear with moderate impact. Applications include: Cable Sheaves, plastics screws, conveyor rolls, rock drills, screw conveyors, cutting edges, sliding metal parts (metal-to-metal wear), bucket teeth, gravel pumps etc. AI-1746BW-TDS AI-1746 is a premium Martensitic Surfacing Alloy alloyed with Chrome and Tungsten. AI-1746 is designed to be used as a matrix for the Bulk Welding Process where AI 14/24 - Tungsten Carbide Chips are dropped into the weld pool. This alloy is designed to prevent ‘matrix wash out’ which happens when mild steel consumable is used in this process. Applications: High impact and wear applications, buckets, conveyor screws, cutting edges, pump components. AI-1705Mn is suitable for one-wire hardfacing where work hardening can be expected. Applications include: Rebuilding of railway frogs and crossovers, railway lines, shovel track pads, and all types of crushers, hammers, manganese steel components, bucket repair and hardfacing, ball mill liners, many earthmoving, quarrying and mining areas. AWS/ASME IIC SFA 5.21 : FeMn-Cr AI-1505 is an open arc surfacing and joining wire used extensively as a buffer layer or build-up on 14% manganese (Hadfield) steel, carbon and other steels prior to hardfacing. It is also extensively used for joining manganese steel to itself or to dissimilar steels. By way of its high chromium content, AI-1505 is suitable for one-wire hardfacing where work hardening can be expected. DIN 8555 T Fe20 MF 21-65-GZ AI-1541 is an open arc tubular wire filled with 40% fused tungsten carbide (FTC) and up to 10% of special refractory carbides for semiautomatic application, where extreme abrasive wear is encountered. On low alloyed steels that have a maximum of 0.45% carbon, the overlay is crack-free or low crack. A higher carbon content may lead to a small degree of relief checking. For hard-facing and repairing tool joints and other drilling and mining parts exposed to extreme wear. A high-performance, yet economical alternative to AI-1779. Applications include: Tunnelling shields, road construction, drilling, geothermal well exploration, excavation, brick making. DIN 8555 T Fe20 MF 21-65-GZ AI-1542VC is an open arc tubular wire filled with a mild steel matrix infused with 7% Vanadium and 19% Chromium (especially hard heat and corrosive-resistant refractory carbides) [1800-2900HV0,2] forming a stable, dense, highly scratch-resistant matrix of iron-chromium, vanadium complex carbides binding 40% Fused Tungsten Carbide (FTC). Use where extreme abrasive wear is encountered in combination with high corrosion. Produces a silvery relief-checked surface when applied to low carbon substrates of <0,45% carbon (a higher carbon content may lead to an increased degree of relief checking). Provides protection against high abrasion, moderate impact in corrosive media. Perfect for all areas of critical importance such as oil-well (HW) drill pipe, downhole stabilisers, hole-opener shoulders and all types other drilling and mining, crushing, boring and tunnelling parts. There is no need to pre-heat base metal although some alloys benefit from a pre-heat of between 150-350°C. It is highly recommended that the voltage and welding current are kept on the lowest possible settings to preserve the integrity of the tungsten carbide granules. During welding, the short arc should be activated such that the weld metal is deposited thickly and smoothly to ensure the tungsten granules are evenly distributed throughout the weld bead. If weld parameters are set too high, the deposit will be too liquid, allowing the tungsten granules to sink to the bottom. Applications include: Mining, excavation, earth moving, geothermal well drilling and deep oil and gas drilling, tunnelling shields, road construction etc. A high quality complex carbide surfacing alloy giving exceptional resistance to all types of abrasion. Deposit achieves full hardness in first layer. Microstructure - primary carbides, M7C3 eutectic carbides and Nodular Niobium carbides (spherical) in a pearlitic matrix. Applications include: Groundnut oil expeller screws, brickwork extruder augers and mixers, wear plates, screens in the coal industry, bucket teeth on bucket-wheel excavators, shovel bucket teeth and lips. T Fe 16-70-GZ AI-1545 is a complex chromium carbide open arc wire. It has an austenitic matrix with complex carbides of different types: chromium rich hexagonal primary carbides, complex eutectic and globular niobium rich carbides. Applications include: sinter plant parts, greenawalt crushers, smelter ladle overlays, exhaust fan blades in pellet plants and sugar cane industry, pearlite crushers, bucket teeth and lips on bucket wheel excavators in the phosphate mines, chutes in blast furnace bell, blast furnace bell burden area. AI-15500 UTP AF VANADIUM 500 Open-Arc flux cored wire for manual or fully automatic on-site "arcing" of sugar mill rolls in view of enhancing the gripping surfaces excessive wear taking place on the rolls during crushing. Special Chromium/Vanadium alloy and homogeneous droplet transfer. AI-1558-TDS DIN 8555 MF 6-GF-60-GP A cladding or build-up alloy containing finely dispersed Titanium carbides in a hard, high chromium martensitic matrix. The deposit is heat treatable and forgeable. Applications include: Crusher cylinders, crusher hammers, agricultural tools, asphalt tools, car shredder, asphalt mixer blades, shovel bucket teeth and lips, bulldozer blades, cane knives and shredders, gyratory crusher mantles, bed knives and anvils in the wood pulp industry. DIN EN14700 : T Fe 8-60-GP AI-1567VC is a C-, Cr-, Mo-alloyed flux-cored wire with the addition of up to 15% special refractory (vanadium) carbides for added hardness and high abrasive wear resistance. This alloy is best suited to protecting parts that are exposed to stresses featuring high pressure wear with high levels of abrasion. It is therefore well suited to hardfacing crusher rolls, pulleys, drums etc. where a high degree of invasive dust or sand is present. It belongs to a class of “crack-free” weld deposits for these specific applications. The micro structure of the deposit is martensitic with evenly distributed hard carbides. For base materials that are high in carbon or difficult to weld, a buffer layer of AI-1707 is recommended. Preheating is recommended. Use in Open Arc or MIG. Applications include: Pulleys, guides, rolls, drums, crusher segments where high levels of friction due to sand / mineral abrasion are primary wear factors. DIN 8555 : MF 10-GF-65-G AI-1568 is a high quality-surfacing alloy designed for continuous, open arc cladding. The alloy will produce coatings, which have excellent resistance to abrasion, even when service conditions include some impact and corrosion.Alloy is particularly successful in applications involving gouging and high stress abrasion in heavy industry. It is suitable for application on to manganese steels. Applications include: Asphalt machinery, palm oil expeller screws, ground nut oil expeller screws, slurry pipes, bends and fittings, pug mill augers, catalytic converter pipes, screw conveyors, dredge pump impellers and casings, shovel bucket teeth and lips, dredge cutters etc. AI-1579-TDS DIN 8555 : MF G-GF-40-G AI-1579 is an open arc, alloy cored wire developed primarily for the semi or fully automatic on-site surfacing of cast-iron or steel in applications where there is a combination of heavy impact and abrasion. The alloy consists of Cr7C3 carbides in an austenitic matrix, which results in a deposit, which provides an economical solution for general hardfacing over a wide variety of applications. AI-1579 has the characteristic of being able to be clad over contaminated surfaces and has an improved deposit efficiency when compared with other wires and electrodes. Applications include: An excellent alloy for use in other areas such as crushers (jaws, hammers, mantles etc), bucket repair, earthmoving equipment, mill liners, grizzly bars etc. Cr- Ni- Mo alloyed and is used for corrosive as well as abrasive wear. AI-1732 can be used as a substitution for Stellite 6 where high temperature operation is not critical. The alloy can be additionally machined with carbide tools. Applications include: Press screws and kneader for meat processing and feeding stuff industry, chemical industry, palm oil screws, conveyer screws. AI-1741-TDS AI-1741 is a cored wire used for hardfacing and rebuilding components subject to metal - metal wear and moderate abrasion with impact. The weld deposit microstructure is of a bainite and martensite structure and is ideal for heavy multi-layer build-up work. The weld deposit exhibits good machinability. Applications include: Build-up of earthmoving equipment such as tractor rollers, idlers, chains and drive sprockets, excavator pads, electric shovel track pads, electric shovel track carrier rolls, steel shafts, trunnions, gears, crane wheels, mine car wheels, steel mill rolls, dredge pins, dredge links, mixer parts, rail car couplings, steel mill roll couplings and any components subject to metal - metal wear. AI-1769-TDS A high quality, gas shielded complex carbide alloy giving exceptional resistance to all types of high stress, low stress and gouging abrasion with low impact. The alloy is manufactured in small diameters (1.2 & 1.6 mm) to allow the ultimate in abrasion resistant surfacing on small components. Deposit achieves full hardness in first layer. Applications include: Groundnut oil expeller screws, brickwork extruder augers and mixers, wear plates, screens in the coal industry, sand pumps, chutes and handling equipment. AI-1785-TDS AI-1785 is a Chromium, Tungsten, Molybdenum gas shielded hardfacing wire giving a heat treatable and forgeable martensitic deposit with a hardness of 52-55 HRc. The alloy is designed to resist low stress abrasion with impact and high compressive stresses. Applications include: Cable Sheaves, plastics screws, animal feed extruder screws, conveyer rolls, rock drills, earthmoving pins, screw conveyors, cutting edges etc. AI-1642-TDS AI-1642 is an alloy specially produced for sub-arc applications where build up and hardfacing of carbon steels is required. This alloy offers resistance to the combined effects of abrasion and impact. AI-1642 has a microstructure of bainite + martensite. It has excellent machineability and can be oxy cut. Applications: AI-1642 is used as a build up and cladding alloy on crawler tractor rollers and idlers, shafts, cylinders, mine car wheels and crane wheels. AI-1685-TDS DIN 8555: UP 6-GF-55-GT AI-1685 is a martensitic alloy giving excellent resistance to metal-to-metal and low stress abrasive wear with impact and high compressive stresses. The deposit is heat treatable and forgeable. Applications: Suitable for steel mill rolls, blast furnace bells (seat area), dredger-buckets, cylinders etc. AI-1685L-TDS DIN 8555: UPI-GF-300-GP AI-1685L is a martensitic alloy giving excellent resistance to metal-to-metal and low stress abrasive wear suitable for steel mill rolls, blast furnace bells (seat area), dredger-buckets, cylinders etc. AI-1685L-C-TDS DIN 8555: UPI-GF-300-GP AI-1685L-C is a martensitic alloy giving excellent resistance to metal-to-metal and low stress abrasive wear suitable for steel mill rolls, blast furnace bells (seat area), dredger-buckets, rope drums, cylinders etc.